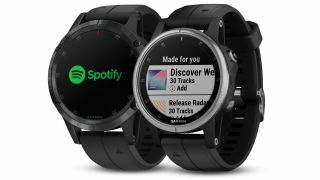 Although Garmin watches have already supported offline music playing for Deezer and iHeartRadio, you'll now also be able to listen to your Spotify playlists while running with one of these watches. The world's most popular music streaming service is now available on the most recent range of Garmin Fenix running watches, including the Fenix 5 Plus, 5S Plus and 5X Plus. This allows Spotify Premium subscribers to download music directly to their watch and listen to it with Bluetooth headphones through a dedicated app that's now available on the Garmin Connect IQ Store. How much you're able to download is unclear at this time, but you should be able to get a few lengthy running playlists onto your watch without any concerns. If you don't have Spotify Premium, you won't be able to download any music to your watch and instead the app will work as a way of scrolling through your library. A Garmin representative has also confirmed to Wareable that the feature will be coming to other running watches in the future, but we don't currently know which ones. The Garmin Forerunner 645 Music jumps to mind as a watch that would be massively improved with a Spotify streaming feature, so we hope that's first on Garmin's upgrade list. If you own one of the most recent Fenix 5 Plus watches, you should head to the Garmin Connect IQ Store to download the Spotify app and start playing around with the offline streaming features now. Best Garmin watch: which is the one for you?